And … one more catch-up post. We have the best pit crew on the planet. 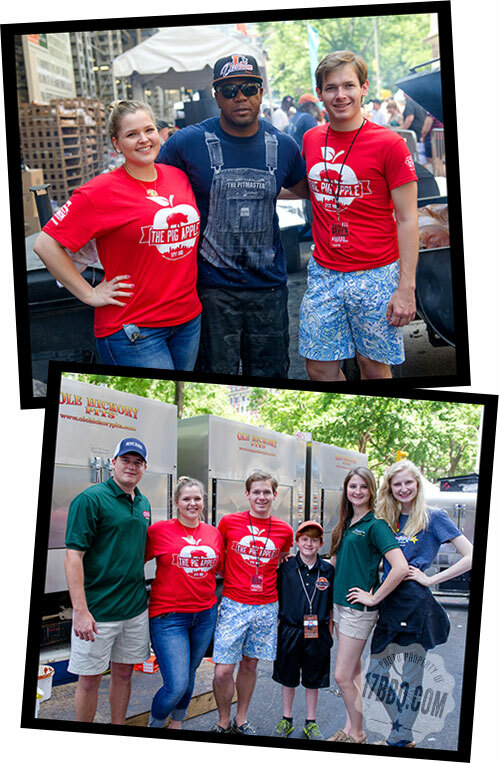 Love that our barbecue family joins up with us, too. 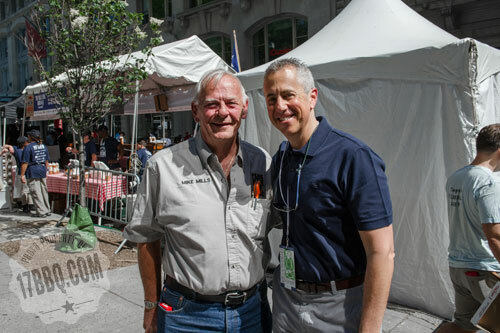 Wayne Mueller, Louie Mueller Barbecue in Taylor Texas, and Barry Sorkin, of Smoque, in Chicago were a huge help. 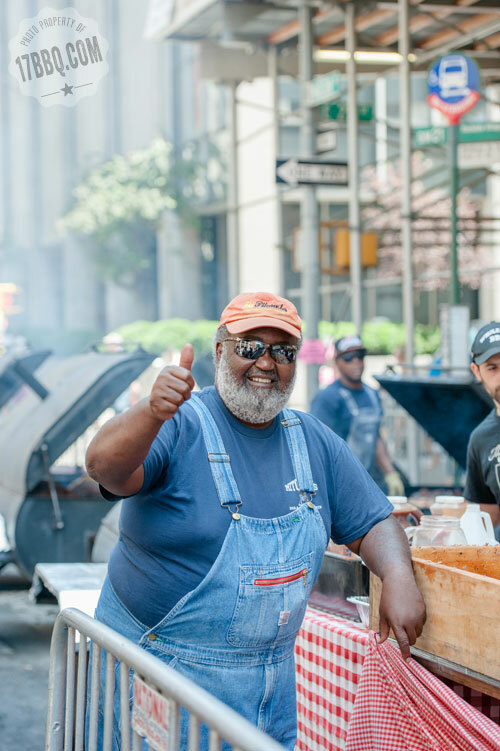 THE PITMASTER Ed Mitchell, the North Carolina legend himself. They don’t come any finer than Don McLemore of Big Bob Gibson. 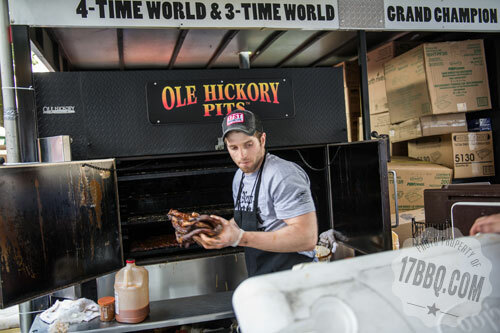 Really proud of our protegé Billy Durney, of Hometown Bar-B-Que in Red Hook, Brooklyn. He was over the moon to be included in the 2014 line-up. This is his sweet daughter, Emma Rose. 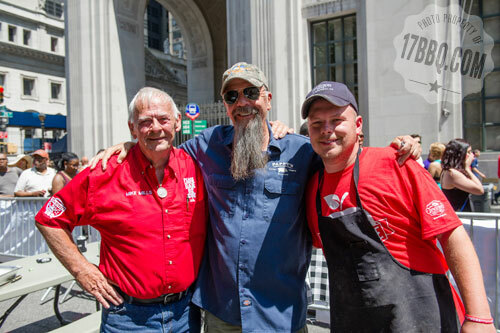 Proudly representing the STL … long-time friend Mike Emerson of Pappy’s Smokehouse with Mike and Phillip Heern. I’m surrounded by brisket boys. 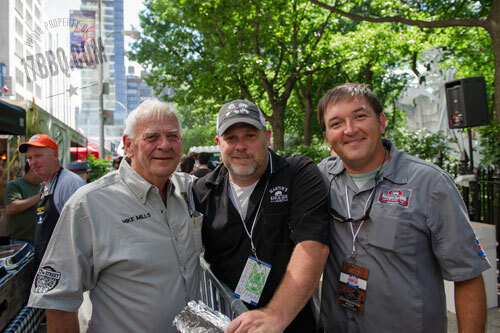 Daniel Delaney of Delaney BBQ and Wayne Mueller. 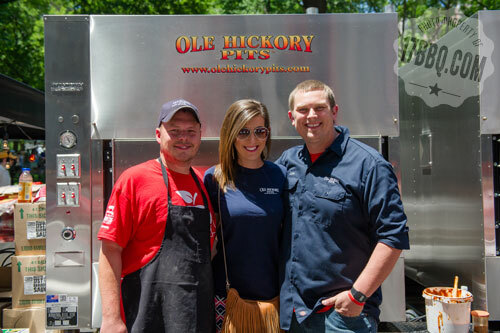 Our pit boss, Phillip Heern, with Elizabeth Knight and Luke Ray of Ole Hickory Pits. The crew. 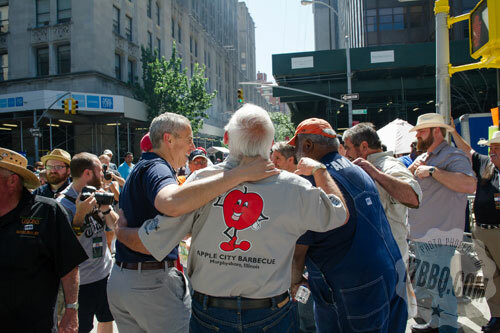 This is our core 17th Street pit crew ..
… and this includes all of our volunteers. The best! 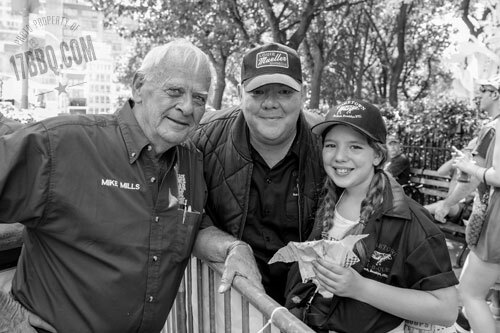 John Hulslander, of Gator John’s BBQ in Ft. Myers, Florida, has attended a handful of our OnCue classes and he’s become a dear friend. 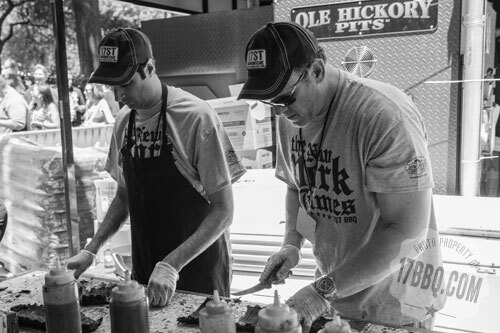 Erik Hernandez is our pitmaster from Memphis Championship Barbecue, our Las Vegas operation. We couldn’t do it without them! Stevie Mitchell, brother of Ed Mitchell. Always a blessing to spend time with him. These guys. 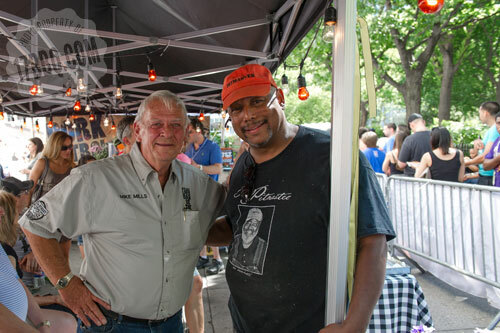 Pat Martin of Martin’s Bar-B-Que Joint in Nashville and more, and Sam Jones of Skylight Inn in Ayden, North Carolina. Barbecue family through and through. 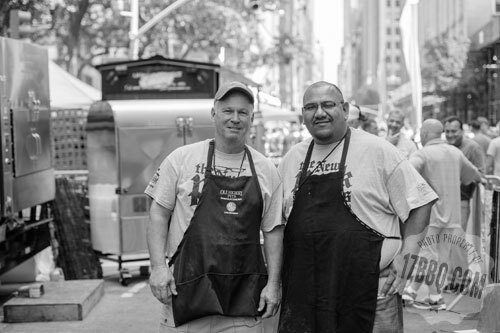 Barry and Wayne are rib-cutting machines. 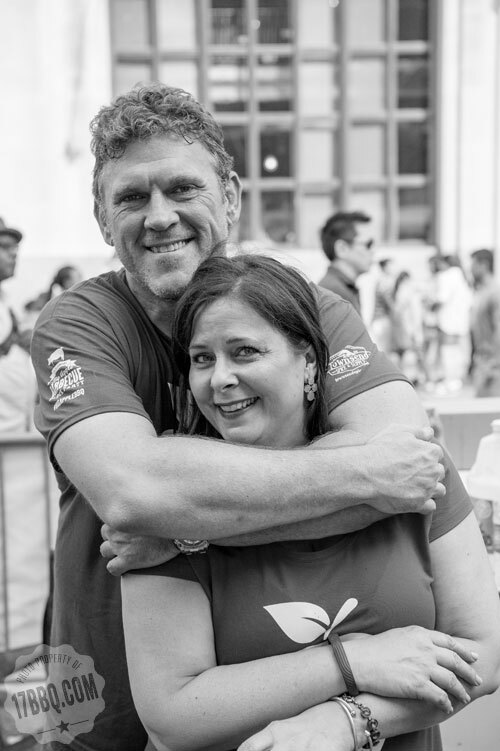 Tracy Heern, a supervisor at our Marion, Illinois restaurant, works alongside Wayne. This was her first trip to New York City. 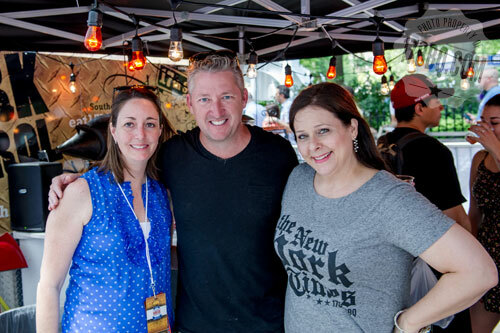 Shelley Phillips, Tim Love, and me. 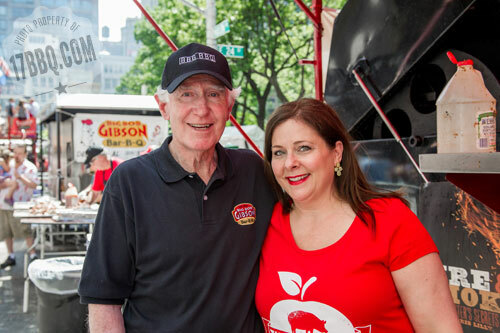 Shelly and Tim are part of C3 Presents, the new owners of the Big Apple Barbecue Block Party. Tracy and Barry are working with Randy Kane and David Bogan, amazing volunteers. 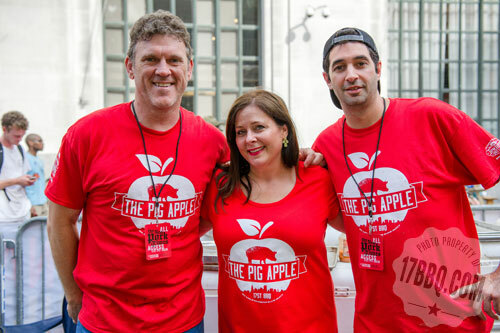 Phillip Lorelle of the Union Square Events kitchen joined up to learn more about working the pits. 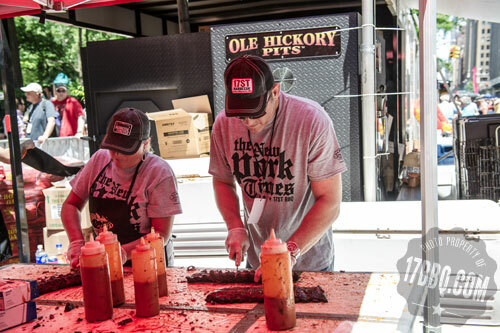 The Union Square Events kitchen also has an Ole Hickory Pit. They produce amazing food. Think about them if you need catering in New York City or the surrounding area! Shane Linn and his son, Lawson Linn, of Townsend Spice. The freshest kitchen spices and custom blenders of dry rubs. You should check them out. Mike and Tim Love. 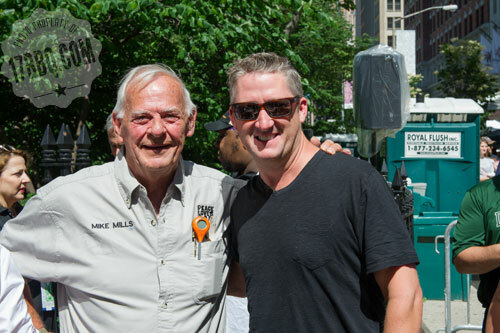 Tim and I met several years ago when we were judges on the Food Network show Best in Smoke. 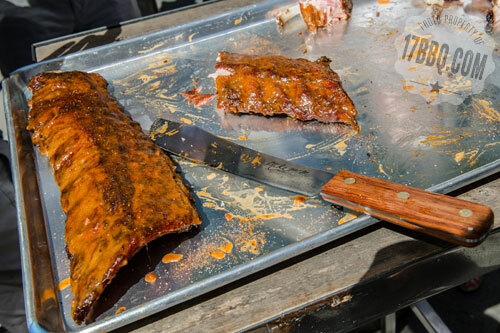 We supplied the ribs for the rib-bon cutting, signifying the opening of the celebration. That’s one of our custom R. Murphy Legend Series knives on the tray. You can buy a set here. 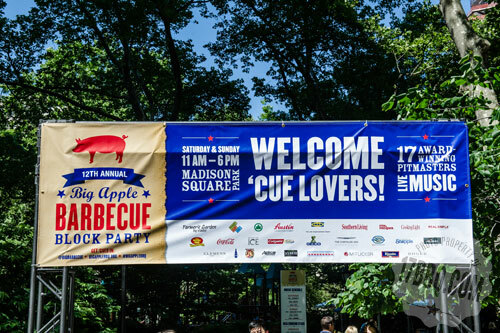 Cheers to the start of the 2014 Big Apple Barbecue Block Party! 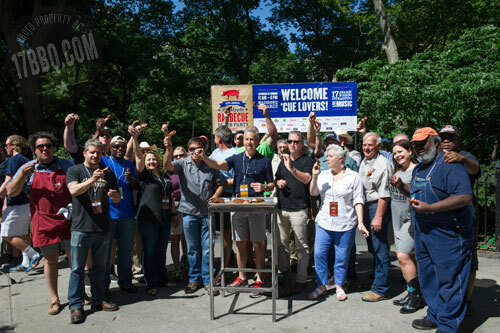 Danny Meyer, Mike, and Ed Mitchell have witnessed the tremendous growth of this party. Pit Crew, day two. Wardrobe change. 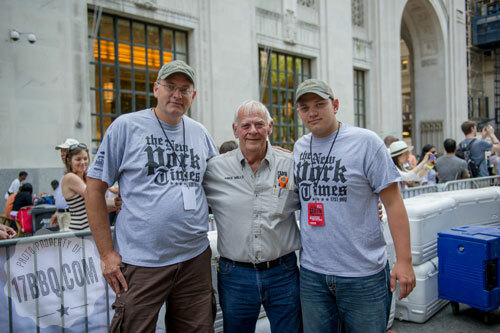 The New Pork Times, reporting for duty. The next generation. These pictures make me smile. Top: My children, Faye Landess and Woody, with Ryan Mitchell, son of Ed Mitchell. 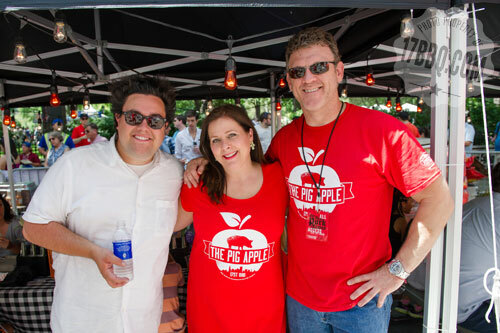 Bottom: Andrew Lilly, son of Chris Lilly, Faye Landess, Woody, and Jacob Scott, Erin Campbell, and Claire Campbell of Ubon’s.